Pots are functional items. However, as we do today, prehistoric people often chose to decorate their pottery. Whilst prehistoric people did not have access to modern coloured glazes, they were able to decorate their pots using a variety of techniques. The decoration of pottery sometimes serves a practical function too. 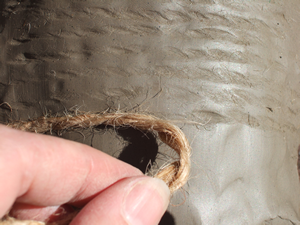 Decorating the surface of the pot can roughen it us, making it less slippery and easier to handle. However, for the most part, decoration served no functional purpose. It may, however, have been used to indicate things such as identity, with different people or communities using different decorative techniques to identify themselves from each other. This is particularly apparent in the Iron Age in southern England, when the tribal system was fully evolved with each group having a distinctive pottery style. Many prehistoric pots were highly decorated; some (particularly early Neolithic pottery) were not decorated at all. The quality of decoration varies dramatically, with some pots decorated with great care and attention, and others show poor decorative techniques and little planning. This means that within any particular type of pottery there can be considerable variation in decoration, with no two pots looking the same. 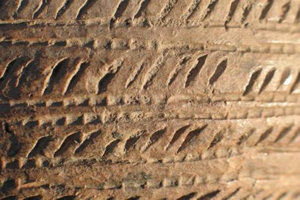 Prehistoric potters had a variety of decorative techniques at their disposal. One of the most commonly used and simplest forms of decoration. As the name implies, incision involves pulling a sharp (or sharpish) implement through wet clay. 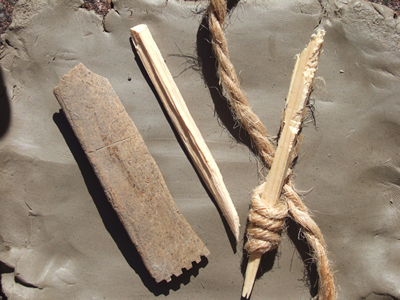 The tools used for this can include straw, a sharpened stick and flint. This results in a groove in the pottery. 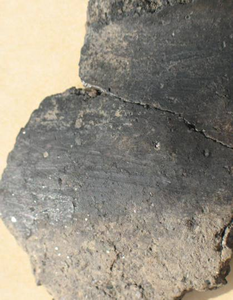 By studying this groove it is possible to identify what type of tool was used – broader, blunter tools result in a much wider groove than sharp points. 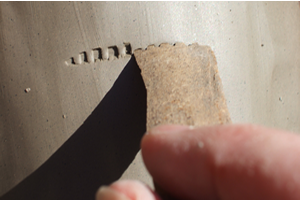 Impression is similar to incision, but the object is simply pressed into the clay then removed without dragging it across the surface of the pot. Lots of different objects were used for this, including bird bones, pieces of string or cord and fingernails. Cord is used very frequently in a variety of different ways. Cord is usually twisted, and the twists can be clearly seen on the pot. This twisted cord may be wrapped around an object such as a stick, creating an impression known as whipped cord. 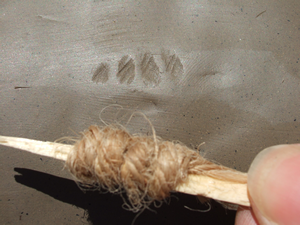 As with incised decoration, it is often possible to detect what material was used to create the impression, with substances such as wool creating a much softer cord impression than something like sinew. Plaited cord can also sometimes be used, although it is less common than twisted cord. Another comparatively common object used to impress decoration was bird bone. 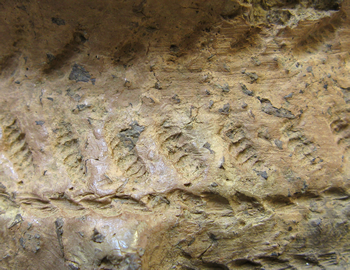 Many different bones were used to create these impressions, and they can create a variety of different impressions, including teardrop shapes and figure of eight impression. Other objects may also be used that create a similar impression. Towards the end of the Neolithic other decorative techniques began to appear, particularly on the new Beakers. 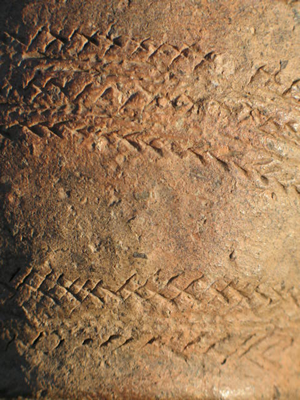 A particularly common form of decoration on Beakers was comb impression. These combs tended to have curved edges, and rather than being like modern tooth combs, the edge was only slightly notched. Also common during this time was fingertip or fingernail impressions. This type of decoration is varied, with different sizes and type of fingertips and fingernails, combined with varying pressures combining to create a wealth of differing impressions, from shallow half moons lightly pressed into the clay to complete impressions of the whole finger tip. All the above techniques involve working with the existing surface of the pot. Another decorative technique is application. Application can produce a similar effect to raised decoration. Raised decoration involved pulling up clay from the surface of the pot to create decorative features; applied decoration involves adding extra clay to the surface of the pot. 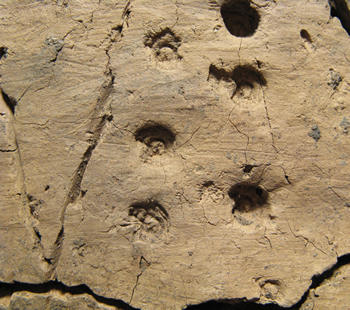 Clay may be applied in strips, encircling the vessel for example, and can also be used in small pellets. A rounded object such as a pebble is rubbed over the surface, which makes the surface smooth and slightly shiny. Burnishing only occurred on undecorated pots (or undecorated areas of otherwise decorated pots), and as such tends to occur more on early Neolithic vessels and later Bronze Age pots. 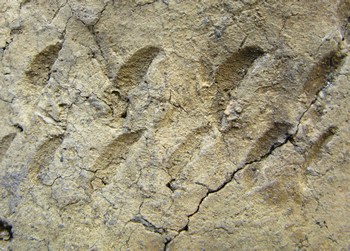 Prehistoric pottery may be decorated with one of these techniques, with a combination of them or with none at all. However, a variety of techniques for decorating pottery were available to prehistoric potters, and they were often used to create very elaborate, decorative pots.